A rare, specially-commissioned Rolex GMT-Master featuring the name of His Highness Sheikh Mohammed bin Rashid Al Maktoum, Vice-President and Prime Minister of the UAE and Ruler of Dubai, on its customised dial will make its debut at the upcoming Christie's Dubai auction of Important Watches on March 23. The watch is estimated at Dh440,000-580,000. Lot 120 is a very fine and extremely rare stainless steel, dual time automatic Rolex wristwatch with sweep centre, seconds, date and bracelet, which was serviced by Rolex Geneva in 2017. Presented in a Rolex box embossed with the crest of the UAE, the timepiece customised commissioned by Sheikh Mohammed also includes a unique artistic representation of the watch - a watercolour on paper combined with digital drawing applied on aluminium, signed by the artist. "Personalised Rolex watches are highly prized gifts, often created to celebrate milestone occasions, and they are highly sought after by regional and international collectors," said Remy Julia, head of watches for Christie's Middle East, India, and Africa. 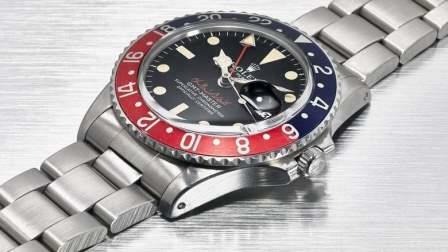 "The present reference 1675 with the name of Sheikh Mohammed in red is an exceedingly rare example of a Rolex GMT-Master model and given that it has never previously been offered to the market, we anticipate strong interest in this timepiece from collectors in the UAE and around the world," he added. With the official founding of the UAE on 2 December 1971, uniting its seven emirates, Sheikh Mohammed was named as the new country's first Minister of Defence, the youngest official in the world to hold this position. It was during this period that watches with his name were ordered, including the Rolex being offered by Christie's. The Al Maktoum personalised GMT-Master will be among the 219 lot strong sale, available for viewing at Jumeirah Emirates Towers as of March 20, and is set to be auctioned on March 23 at 5 pm.